Tags: idle, champions, early, access, update, event, grand revel, birdsong, paultin, dice camera action, waffle crew. Grand Revel has returned to the Chult, and a day of dancing, music, and decadence has begun at Camp Vengeance. Grand Revel 2 runs until Monday, February 18th, 2019 at 12:00pm PST, introduces the Vistani Bard from Dice, Camera, Action!, Paultin Seppa, and brings back Birdsong, the Tabaxi Bard from Chult! Paultin and his "son" Simon (AKA Murderbot) have been adventuring as part of the Waffle Crew for many years. Paultin is a wise-cracking adventurer who is more at home at a tavern than anywhere else. He cares deeply for those he considers his friends and will leap into action if anyone hurts them. Paultin Seppa is a Support Champion whose Muderbot son, Simon, rides atop his shoulders. Paultin increases Gold Find through his Lucky ability and increases the DPS of Champions who are not adjacent to him based upon the number of Champions who are with his Magical Secrets ability. Paultin doesn't always attack, choosing instead to drink from his wineskin or play his bagpipes while Simon shoots poison darts at enemies. When you want to add Paultin to your formation, you can swap him with Jarlaxle (Slot 4). 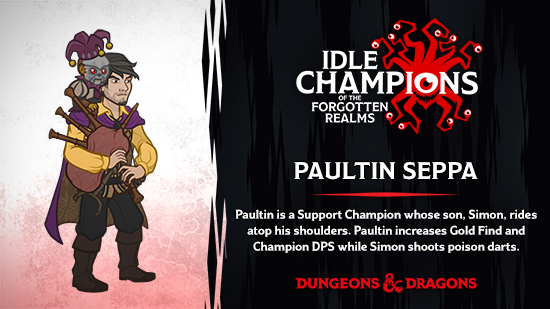 For more information about our latest Champion, check out the Idle Champion Spotlight: Paultin dev blog! Birdsong, a cunning young Tabaxi bard, learned to defend herself while enslaved by the Yuan-Ti. Proficient in playing the lute, Birdsong discovered her potential as a bard when witnessing the effect of her songs had on other slaves. After her escape, she became one of the greatest minstels of Chult. She promised herself to, one day, get the revenge on the Yuan-Ti who destroyed her village. 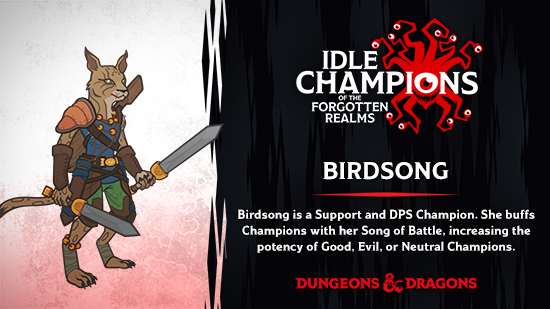 Birdsong is a Support and DPS Champion. She buffs Champions within two spaces with her Song of Battle ability, and can greatly increasing the potency of Good, Evil, or Neutral Champions depending on which specialization she uses. When you want to add Birdsong to your party, you can swap her with Makos (Slot 9). Flower for Nanny Pu-pu — Magical floating crates of flowers take up four slots in the formation. Grand Revel Rock Band — Paultin begins the adventure in the formation. Only Bards with a Charisma (CHA) score of 15 or higher may be used. Love Hurts — Hordes of adoring fans attack the formation! Superfans, Infatuated Fans, Burly Fans, and Persistent Fans, spawn in each area and attack the formation, each with different abilities. Three's a Crowd — Any Champion that is adjacent to more than 1 other Champion has their damage reduced to 0. Pair Up — Your ratio of women to men in your formation cannot be off by more than one (at all times you must have an equal number of men and women, or 1 more man than woman or vise-versa). Love Potion — Every 25 areas, two Champions drink a love potion and fall deeply in love. For those 25 areas, if those Champions are adjacent to each other in the formation they do bonus damage themselves (x4), and buff global damage as well (x3). The chosen Champion combos are fixed rather than random.